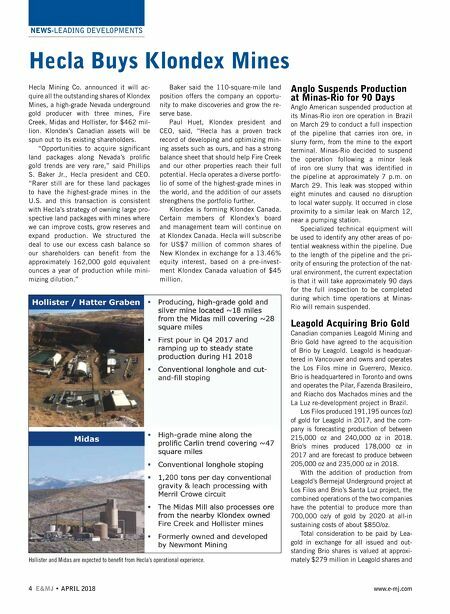 NEWS-LEADING DEVELOPMENTS 4 E&MJ • APRIL 2018 www.e-mj.com Hecla Buys Klondex Mines Hecla Mining Co. announced it will ac- quire all the outstanding shares of Klondex Mines, a high-grade Nevada underground gold producer with three mines, Fire Creek, Midas and Hollister, for $462 mil- lion. Klondex's Canadian assets will be spun out to its existing shareholders. "Opportunities to acquire significant land packages along Nevada's prolific gold trends are very rare," said Phillips S. Baker Jr., Hecla president and CEO. "Rarer still are for these land packages to have the highest-grade mines in the U.S. and this transaction is consistent with Hecla's strategy of owning large pro- spective land packages with mines where we can improve costs, grow reserves and expand production. We structured the deal to use our excess cash balance so our shareholders can benefit from the approximately 162,000 gold equivalent ounces a year of production while mini- mizing dilution." Baker said the 110-square-mile land position offers the company an opportu- nity to make discoveries and grow the re- serve base. 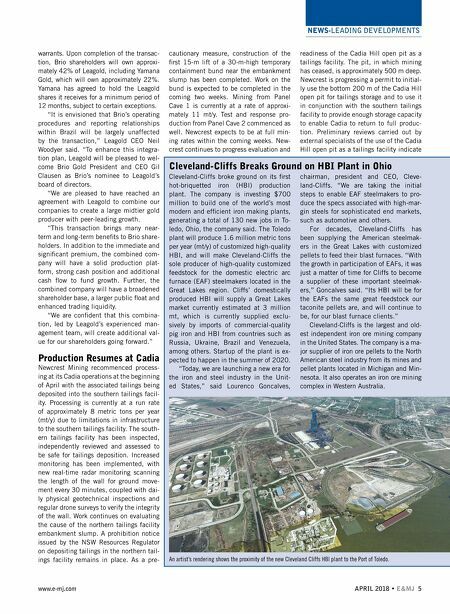 Paul Huet, Klondex president and CEO, said, "Hecla has a proven track record of developing and optimizing min- ing assets such as ours, and has a strong balance sheet that should help Fire Creek and our other properties reach their full potential. Hecla operates a diverse portfo- lio of some of the highest-grade mines in the world, and the addition of our assets strengthens the portfolio further. Klondex is forming Klondex Canada. Certain members of Klondex's board and management team will continue on at Klondex Canada. Hecla will subscribe for US$7 million of common shares of New Klondex in exchange for a 13.46% equity interest, based on a pre-invest- ment Klondex Canada valuation of $45 million. Anglo Suspends Production at Minas-Rio for 90 Days Anglo American suspended production at its Minas-Rio iron ore operation in Brazil on March 29 to conduct a full inspection of the pipeline that carries iron ore, in slurry form, from the mine to the export terminal. Minas-Rio decided to suspend the operation following a minor leak of iron ore slurry that was identified in the pipeline at approximately 7 p.m. on March 29. This leak was stopped within eight minutes and caused no disruption to local water supply. It occurred in close proximity to a similar leak on March 12, near a pumping station. Specialized technical equipment will be used to identify any other areas of po- tential weakness within the pipeline. Due to the length of the pipeline and the pri- ority of ensuring the protection of the nat- ural environment, the current expectation is that it will take approximately 90 days for the full inspection to be completed during which time operations at Minas- Rio will remain suspended. Leagold Acquiring Brio Gold Canadian companies Leagold Mining and Brio Gold have agreed to the acquisition of Brio by Leagold. Leagold is headquar- tered in Vancouver and owns and operates the Los Filos mine in Guerrero, Mexico. Brio is headquartered in Toronto and owns and operates the Pilar, Fazenda Brasileiro, and Riacho dos Machados mines and the La Luz re-development project in Brazil. Los Filos produced 191,195 ounces (oz) of gold for Leagold in 2017, and the com- pany is forecasting production of between 215,000 oz and 240,000 oz in 2018. Brio's mines produced 178,000 oz in 2017 and are forecast to produce between 205,000 oz and 235,000 oz in 2018. With the addition of production from Leagold's Bermejal Underground project at Los Filos and Brio's Santa Luz project, the combined operations of the two companies have the potential to produce more than 700,000 oz/y of gold by 2020 at all-in sustaining costs of about $850/oz. Total consideration to be paid by Lea- gold in exchange for all issued and out- standing Brio shares is valued at approxi- mately $279 million in Leagold shares and Hollister and Midas are expected to benefit from Hecla's operational experience.